(Galerie Heim, Paris); purchased by Ian Woodner, New York, 8 May 1972; by inheritance to his daughters, Andrea and Dian Woodner, New York, 1990; gift to NGA, 1991. Woodner Collection II: Old Master Drawings from the XV to the XVIII Century, William H. Schab Gallery, New York, and tour, 1973-74, no. 105. Old Master Drawings from American Collections. Los Angeles County Museum of Art, Los Angeles, 1976, no. 156 (Ebria Feinblatt). The Touch of the Artist: Master Drawings from the Woodner Collections, National Gallery of Art, Washington, 1995-1996, no. 85 (entry by Ann MacNary). Jones, Jennifer. "The Woodner Collections at the National Gallery." Drawing 17 (September-October 1995): 53, fig. 9. Jeffares, Neil. Dictionary of Pastellists before 1800. London, 2006: 410-411. D'Arnoult, Dominique. 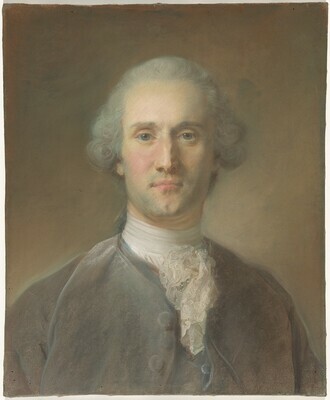 Jean-Baptiste Perronneau, ca. 1715 - 1783. Paris, 2014: no. 199 Pa, illustrated on 193, and 200, note 1049.